The Art of Decluttering | Listen Free on Castbox. 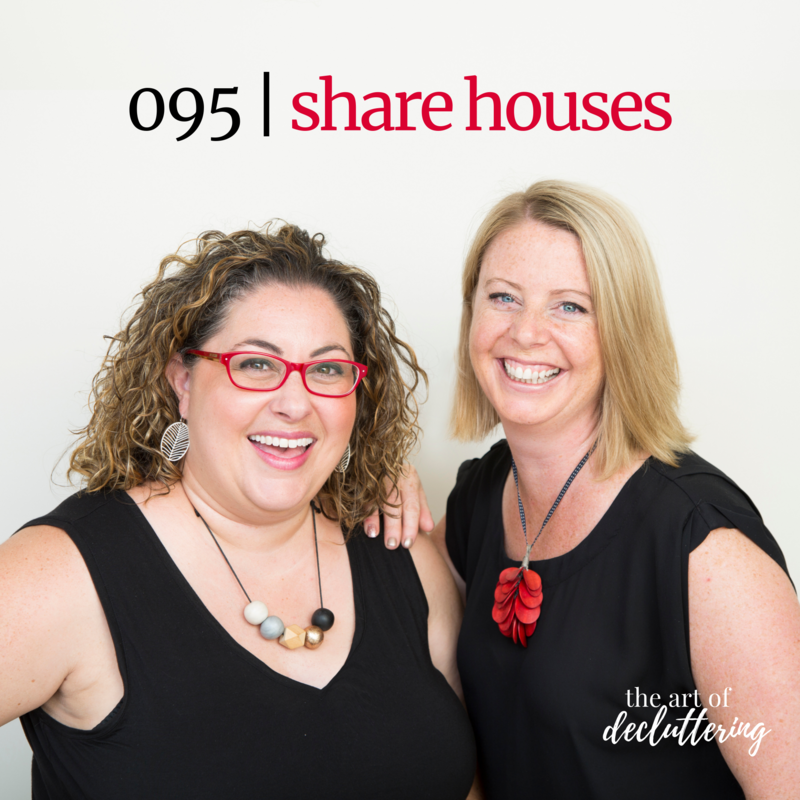 This week we chat all about living in share houses! We chat about the challenge of only having that one room to store all of your things in and different ideas around this concept. We encourage you to make the most of the space you do have, think creatively and vertically about where and how to store your things. We chat about the role that storage units can play for short term storage and the concept of renting out your belongings to others if you end up having multiples of common use items in the one home. There is so much joy and learning to be had in a shared home so we hope that those of you who are living this will enjoy and others can reminisce the time in your lives when this was your reality. As always we hope you have a giggle with us and enjoy the conversation!Thanks Elly Unicomb for the topic request and Jjjodynz for our iTunes review this week!We would love you to join in the discussion of decluttering over on our Facebook page and Instagram page and our ALL NEW Facebook Community.If you do love the show and would like to show your support by becoming a patron, head over here to make a small monthly donation (as little as $1 a month) and know that any amount makes a huge difference to us being able to cover costs of producing this podcast.You also have the chance to sign up to receive the BONUS SECRET EPISODE that Kirsty & Amy recorded for their Art of Decluttering friends. Visit www.theartofdecluttering.com.au to subscribe and listen.Kirsty's Website: www.feelslikehome.net.auAmy's Website: www.simplyorganised.netArt of Decluttering Facebook Page: www.facebook.com/artofdeclutteringMassive thanks go to Jarred from www.four4ty.com.au for having us in your studio to record and helping us sound so amazing!! This week we have our first international guest, Laurie Palau! She is our great friend and fellow Professional Organizer from the USA (yes we are using Z where we normally use S's today in homage to our guest today ;-)) Laurie is the author of the book HOT MESS: A Practical Guide to Getting Organized, host of the weekly podcast, This ORGANIZED Life, and the founder of simply B organized where she speaks, teaches and works one-on-one with clients to help them reduce clutter and increase productivity. We chat about the three categories she sees as causing clutter in our lives, her partner program and what she struggles within her home. We love that Laurie has the same philosophy as us that we want people to live in organised homes so that they can have the freedom to do the things they love to do and that brings them life. We absolutely adored having Laurie with us and as always we hope you have a giggle with us and enjoy the conversation!The many things that were mentioned in this episode:Here is Laurie's quiz to figure out what area of clutter is your biggest nemesis: https://simplyborganized.lpages.co/clutter-quiz/Here is where you will find our Partner's around the world: https://www.simplyborganized.com/find-a-partner/Laurie's episode where she interviewed us : https://www.simplyborganized.com/2019/01/03/ep-108-2019-goal-setting-with-special-guests-kirsty-farrugia-amy-revell/Laurie's article about being the CEO of your home: https://www.simplyborganized.com/2016/12/17/home-organizing-expert/Laurie's podcast about being the CEO of your home: https://www.simplyborganized.com/2017/02/01/podcast-ep007-are-you-the-ceo-of-your-home/Episode 19 | Digital Life : https://artofdecluttering.com.au/019-digital-life/Episode 87 | Social Media: https://artofdecluttering.com.au/087-social-media/Episode 85 | Mental Load: https://artofdecluttering.com.au/085-mental-load/Thank you to our new Patreon supporters, Amy K & Jen!We would love you to join in the discussion of decluttering over on our Facebook page and Instagram page and our ALL NEW Facebook Community.If you do love the show and would like to show your support by becoming a patron, head over here to make a small monthly donation (as little as $1 a month) and know that any amount makes a huge difference to us being able to cover costs of producing this podcast.You also have the chance to sign up to receive the BONUS SECRET EPISODE that Kirsty & Amy recorded for their Art of Decluttering friends. Visit www.theartofdecluttering.com.au to subscribe and listen.Kirsty's Website: www.feelslikehome.net.auAmy's Website: www.simplyorganised.netArt of Decluttering Facebook Page: www.facebook.com/artofdeclutteringMassive thanks go to Jarred from www.four4ty.com.au for having us in your studio to record and helping us sound so amazing!! This week we chat all about decluttering and organising your picnic gear, thanks to the request made by Geraldine Van Oord! We laugh about getting older and needing cushions and chairs to go on a picnic! We discuss our opinion that as a culture we have moved from a picnicking culture to a cafe culture and how we are so incredibly middle class! We chat about big heavy old style picnic baskets and menopause! We give tips on where to store your picnic things, plastic versus metal utensils and question just how many napkins you need to store just in case! As always we hope you have a giggle with us and enjoy the conversation!Our iTunes review this week was from Dinosad!We would love you to join in the discussion of decluttering over on our Facebook page and Instagram page and our ALL NEW Facebook Community.If you do love the show and would like to show your support by becoming a patron, head over here to make a small monthly donation (as little as $1 a month) and know that any amount makes a huge difference to us being able to cover costs of producing this podcast.You also have the chance to sign up to receive the BONUS SECRET EPISODE that Kirsty & Amy recorded for their Art of Decluttering friends. Visit www.theartofdecluttering.com.au to subscribe and listen.Kirsty's Website: www.feelslikehome.net.auAmy's Website: www.simplyorganised.netArt of Decluttering Facebook Page: www.facebook.com/artofdeclutteringMassive thanks go to Jarred from www.four4ty.com.au for having us in your studio to record and helping us sound so amazing!! This week we chat about home offices! We have two each in our homes so we share what they look like and how they have changed over time. We encourage you to set a vision for your home office and challenge you to consider the amount of furniture you actually need in your office space. What storage do you need for your office? We ask you to think about the function of your office, what is frustrating you in the processes and in the layout of your home office? We chat about how a decluttered and organised home office will help you increase your creativity and productivity and this space is where the KISS principle is essential! 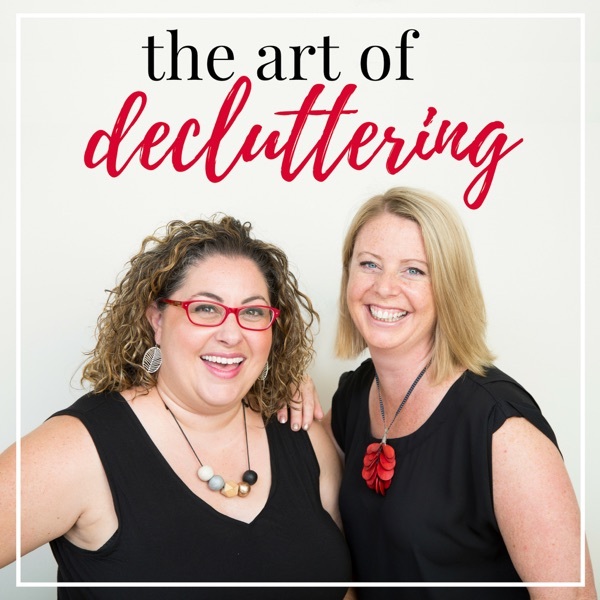 As always we hope you have a giggle with us and enjoy the conversation!Thanks to LizInBriz for the iTunes review :-)This week's episode is sponsored by The Space Cube https://thespacecube.com.au/Things we chatted about:Episode 53: Small Businesshttps://artofdecluttering.com.au/053-small-business/Episode 39: Office Deskhttps://artofdecluttering.com.au/039-officedesk/We would love you to join in the discussion of decluttering over on our Facebook page and Instagram page and our ALL NEW Facebook Community.If you do love the show and would like to show your support by becoming a patron, head over here to make a small monthly donation (as little as $1 a month) and know that any amount makes a huge difference to us being able to cover costs of producing this podcast.You also have the chance to sign up to receive the BONUS SECRET EPISODE that Kirsty & Amy recorded for their Art of Decluttering friends. Visit www.theartofdecluttering.com.au to subscribe and listen.Kirsty's Website: www.feelslikehome.net.auAmy's Website: www.simplyorganised.netArt of Decluttering Facebook Page: www.facebook.com/artofdeclutteringMassive thanks go to Jarred from www.four4ty.com.au for having us in your studio to record and helping us sound so amazing!! This week we answer a question we were asked by Jarred, can you declutter too much? Our answer is no, but perhaps yes! We do talk briefly about obsessive behaviours and that people can get the bug for decluttering and can possibly remove things that they regret. However in our professional experience we find the opposite is more the case. We often find that people can't remember what they have in boxes and we discover long lost loved items. The power of decluttering is that you will find things that you thought was lost and you will find things that you hadn't remembered you had and know you no longer need. We also ask if you can declutter too slowly or too quickly? We believe intentionality and wisdom are key in all things decluttering. Sometimes we even have to slow our clients down! Our heart for you to work on your habits and mindsets to stop the yo-yo dieting effect of splurging and then decluttering. As always we hope you have a giggle with us and enjoy the conversation!This weeks topic was requested by Jarred from www.four4ty.com.au . Our iTunes review this week was from Closet Cleaning, thanks!Things we chatted about:Episode 55: Deathhttps://artofdecluttering.com.au/055-death/Episode 48: Sentimental itemshttps://artofdecluttering.com.au/048-sentimental-items/We would love you to join in the discussion of decluttering over on our Facebook page and Instagram page and our ALL NEW Facebook Community.If you do love the show and would like to show your support by becoming a patron, head over here to make a small monthly donation (as little as $1 a month) and know that any amount makes a huge difference to us being able to cover costs of producing this podcast.You also have the chance to sign up to receive the BONUS SECRET EPISODE that Kirsty & Amy recorded for their Art of Decluttering friends. Visit www.theartofdecluttering.com.au to subscribe and listen.Kirsty's Website: www.feelslikehome.net.auAmy's Website: www.simplyorganised.netArt of Decluttering Facebook Page: www.facebook.com/artofdeclutteringMassive thanks go to Jarred from www.four4ty.com.au for having us in your studio to record and helping us sound so amazing!! 091 | Can you declutter too much? What is your favourite room in your home? Is it your Master Bedroom? Why? Why not? Do you know the difference between a pillow or cushion? (Listen out for Kirsty's mistake when she chats about them.) We challenge you to make it a priority this week to reclaim the serenity and peace of your bedroom by decluttering it. Our antidotal evidence is that you will sleep better if your room is decluttered, no matter what your age. Our master bedrooms can become the dumping room because we close the doors and people aren't often invited into this space. We encourage you to create a vision for this room this week and decide on the purpose, especially if it needs to serve more than one purpose. We give you some really easy steps to declutter your room, reclaim it as yours and honour yourself in the process. As always we hope you have a giggle with us and enjoy the conversation!This weeks topic was requested by Geraldine van Oord, thanks lovely! iTunes review this week from KT Hultson! Recommended in this podcast: Episode 055: Grace & Freedom Head over to Facebook to see photos & video of Kirsty's bedroom.We would love you to join in the discussion of decluttering over on our Facebook page and Instagram page and our ALL NEW Facebook Community.If you do love the show and would like to show your support by becoming a patron, head over here to make a small monthly donation (as little as $1 a month) and know that any amount makes a huge difference to us being able to cover costs of producing this podcast.You also have the chance to sign up to receive the BONUS SECRET EPISODE that Kirsty & Amy recorded for their Art of Decluttering friends. Visit www.theartofdecluttering.com.au to subscribe and listen.Kirsty's Website: www.feelslikehome.net.auAmy's Website: www.simplyorganised.netArt of Decluttering Facebook Page: www.facebook.com/artofdeclutteringMassive thanks go to Jarred from www.four4ty.com.au for having us in your studio to record and helping us sound so amazing!! This week we are open, honest and vulnerable as we share with you the mistakes we have made as Professional Organisers. We ask each other the following questions; Have you ever walked into a space and realised that this job was not for you? Have you worked with anyone we regretted? Do we have any disgruntled clients? Have we ever thrown out something by mistake? Have we had clients unhappy with the process or with us? Have you ever organised a space and the client hated it? We also give a huge apology to anyone we have hurt unintentionally. We also encourage you to come over to our Facebook group and ask any questions of our clients if you want honest reviews from them. As always we hope you have a giggle with us and enjoy the conversation!This weeks topic was requested by Teresa Boughton, thanks lovely! Chantelle Griffin was our itunes review this week!This week's episode is sponsored by Professional Organiser Training by Angela Esnouf from The Professional Organiser's Edge.Things we chatted about: Episode 83: We're not but we do https://artofdecluttering.com.au/083-were-not-but-we-do/We would love you to join in the discussion of decluttering over on our Facebook page and Instagram page and our ALL NEW Facebook Community.If you do love the show and would like to show your support by becoming a patron, head over here to make a small monthly donation (as little as $1 a month) and know that any amount makes a huge difference to us being able to cover costs of producing this podcast.You also have the chance to sign up to receive the BONUS SECRET EPISODE that Kirsty & Amy recorded for their Art of Decluttering friends. Visit www.theartofdecluttering.com.au to subscribe and listen.Kirsty's Website: www.feelslikehome.net.auAmy's Website: www.simplyorganised.netArt of Decluttering Facebook Page: www.facebook.com/artofdeclutteringMassive thanks go to Jarred from www.four4ty.com.au for having us in your studio to record and helping us sound so amazing!! This week Aunty Amy and Aunty Kirsty come with love to question some of your beliefs challenge you thinking about YOU! We recommend going for a walk, or run or walk the dog to processes some of your frustration at us as we deliver some truth bombs in love and grace because we want the best for you! Is there clutter in your home that it is always someone else fault? If only your kids or partner or housemate dealt with their clutter, your house would be a instagrammable home, right? We want to challenge you that maybe you are also responsible for some of the clutter in your home? Maybe you are also a bit of a clutter bug but manage to hide your clutter better? Maybe you need discipline because you know things are clutter but you also know you will get to it one day and you have the mental tab is still opened by you just haven't made it a priority. We want to give you tips to help and empower those around you as well as to know what you can change so you aren't constantly frustrated by the people you live with. We want to encourage you that you are a leader in your home and you can set the standard for a clutter-free home. We absolutely love you all and want you to live in the freedom that a clutter-free home brings. As always we hope you have a giggle with us and enjoy the conversation!Things mentioned in today's showEpisode 044: Inside ScoopEpisode 078: Our KidsOne we forgot to mention in recording but is brilliant for this topic too is Episode 065: James' HouseWe would love you to join in the discussion of decluttering over on our Facebook page and Instagram page and our Facebook Community.If you have a business and would like to reach our audience via sponsorship please contact us via hello@theartofdecluttering.com.au and we will send you our sponsorship kit.If you do love the show and would like to show your support by becoming a patron, head over here to make a small monthly donation (as little as $1 a month) and know that any amount makes a huge difference to us being able to cover costs of producing this podcast.You also have the chance to sign up to receive the BONUS SECRET EPISODE that Kirsty & Amy recorded for their Art of Decluttering friends. Visit www.theartofdecluttering.com.au to subscribe and listen.Kirsty's Website: www.feelslikehome.net.auAmy's Website: www.simplyorganised.netArt of Decluttering Facebook Page: www.facebook.com/artofdeclutteringMassive thanks go to Jarred from www.four4ty.com.au for having us in your studio to record and helping us sound so amazing!! This week we chat about the Social Media, perfect thing to declutter after last week's episode on the Mental Load! Does the thought of decluttering your social media life terrify you or is it your dream? We really want you to encourage you this week to be thoughtful and intentional about what you engage with and what you let influence your life. Do you procrastiscroll? Yes it is a thing! Do you suffer from comparintintis (yes again it is a real thing ;-)) We want you to ask yourself some questions; Why do you use the platform? What value does it add to your life? What is the purpose of the social media channel for you? What are you using it for? 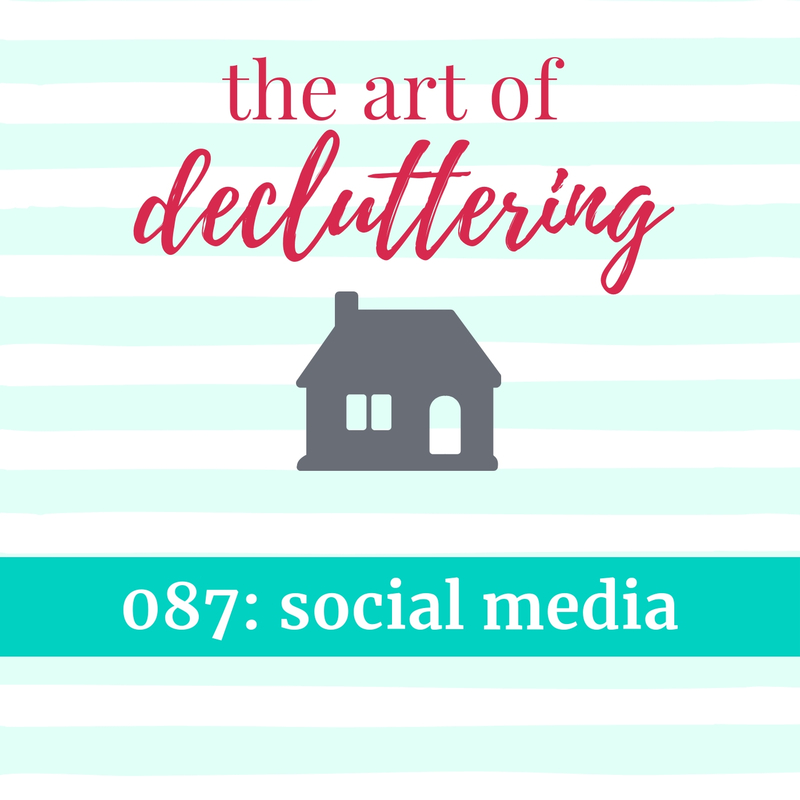 Did you know that The Art of Decluttering would not exist without Facebook? We hope you have a giggle with us and enjoy the conversation!This topic was requested by Joanne Cassidy! And thanks Jess Gimm for the FB review!Things mentioned in this episode:The Art of Decluttering Episode 19: Digital LifeArt of Decluttering Facebook CommunityArt of Decluttering FacebookArt of Declutteriing InstagramFeels Like Home Professional Organisers (Kirsty) FacebookSimply Organised (Amy) FacebookFeels Like Home Professional Organisers InstagramSimply Organised InstagramSlow Your Home PodcastIf you do love the show and would like to show your support by becoming a patron, head over here to make a small monthly donation (as little as $1 a month) and know that any amount makes a huge difference to us being able to cover costs of producing this podcast.You also have the chance to sign up to receive the BONUS SECRET EPISODE that Kirsty & Amy recorded for their Art of Decluttering friends. Visit www.theartofdecluttering.com.au to subscribe and listen.Kirsty's Website: www.feelslikehome.net.auAmy's Website: www.simplyorganised.netArt of Decluttering Facebook Page: www.facebook.com/artofdeclutteringMassive thanks go to Jarred from www.four4ty.com.au for having us in your studio to record and helping us sound so amazing!! 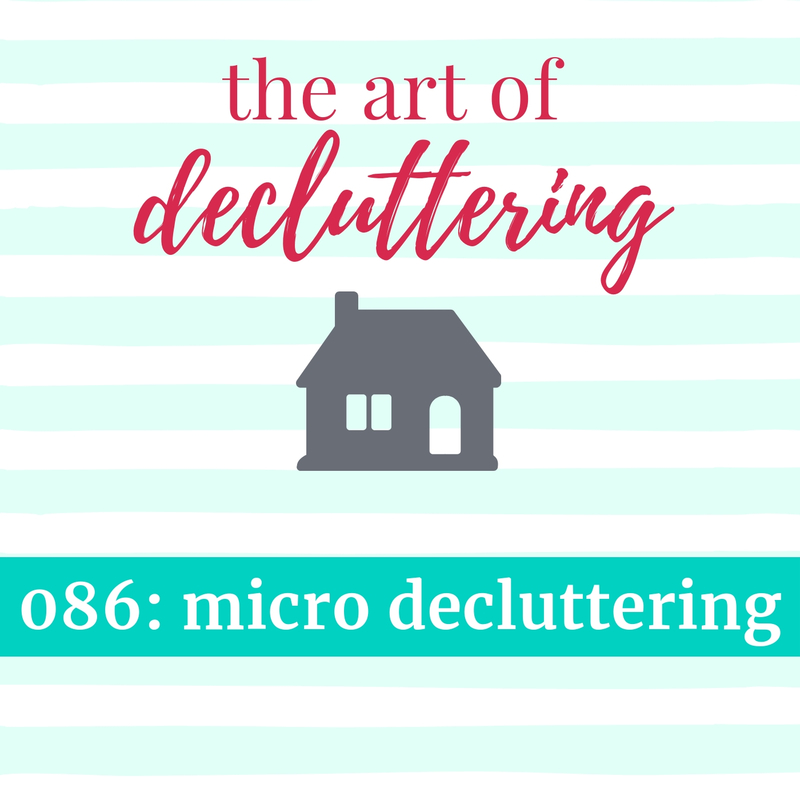 This week we chat about Micro Decluttering! We know that many of you don't have hours and hours each week to dedicate to decluttering and organising your home so we created the idea of a Micro Declutter! The idea is you take a small pocket of time, 2 minutes, and choose an area to quickly declutter. You could be waiting for the microwave to bing or the kettle to boil, any small pocket of time, grab the Bingo sheet and get decluttering! We created a Bingo Game to go along with today's episode and as always we hope you have a giggle with us and enjoy the conversation!This week's episode is sponsored by Professional Organiser Training by Angela Esnouf from The Professional Organiser's Edge.We would love you to join in the discussion of decluttering over on our Facebook page and Instagram page and our ALL NEW Facebook Community.If you do love the show and would like to show your support by becoming a patron, head over here to make a small monthly donation (as little as $1 a month) and know that any amount makes a huge difference to us being able to cover costs of producing this podcast.You also have the chance to sign up to receive the BONUS SECRET EPISODE that Kirsty & Amy recorded for their Art of Decluttering friends. Visit www.theartofdecluttering.com.au to subscribe and listen.Kirsty's Website: www.feelslikehome.net.auAmy's Website: www.simplyorganised.netArt of Decluttering Facebook Page: www.facebook.com/artofdeclutteringMassive thanks go to Jarred from www.four4ty.com.au for having us in your studio to record and helping us sound so amazing!! OMG finally worked everything out today. Listened to wardrobe part 1 this morning on my 1hr ride to work and time for part 2. Picked up some awesome ideas. Thk you ladies.